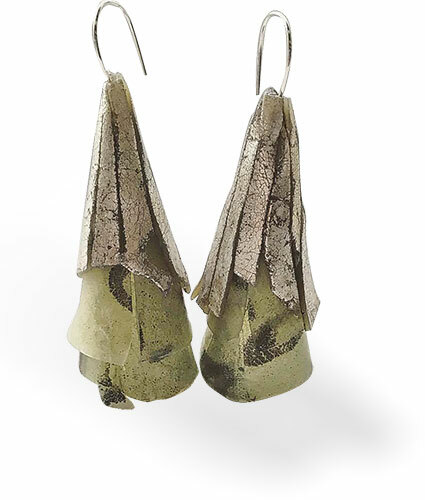 After a frustrating day in the studio, it’s a relief to me to see how something like these post earrings from South Carolina’s Shannon Tabor (Charleston_Clay_Jewelry) can be so straightforward and successful. Sometimes we make things more difficult than they need to be. 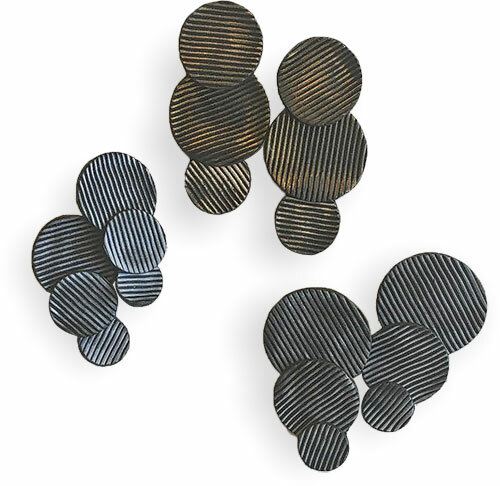 Shannon cuts textured circles in several sizes then highlights the textures and stacks them falling downward. Unusual, sophisticated and done! Posted on Instagram. 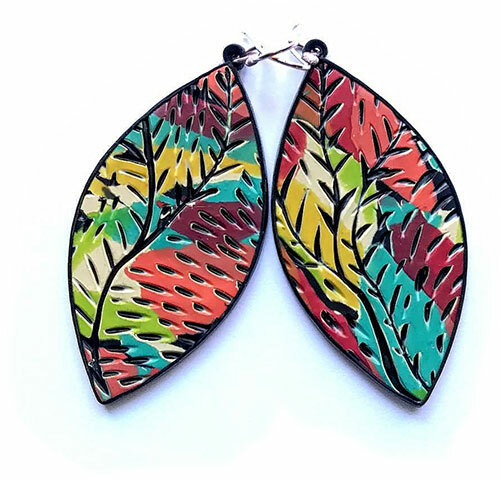 Think of polymer techniques as having a lineage when you look at these earrings from Texas’ Shelley Atwood. Kathy Amt taught Dayle Doroshow who shared it with me who showed a whole bunch of folks this scrap technique on video. Who knows where it came from even earlier or where it will go next? It’s circled back around to Shelley who’s put her own spin on it on Instagram. Shelley layered thin bits of scrap and then carved her design, which revealed colors underneath. It’s invigorating when we see new life in our roots. 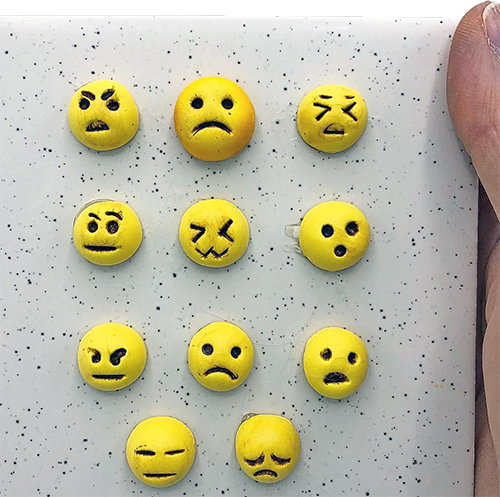 Connecticut’s Carole Monahan (CuriousClayCreations on Instagram) made little emoji for her guild’s upcoming open studio. Aren’t they totally cute? Little balls of yellow textured with the appropriate face and accentuated with paint. Carole says the whole series will be displayed in a bottle she’s labeled FEELINGS. Who wouldn’t like these as magnets, pins, or earrings? 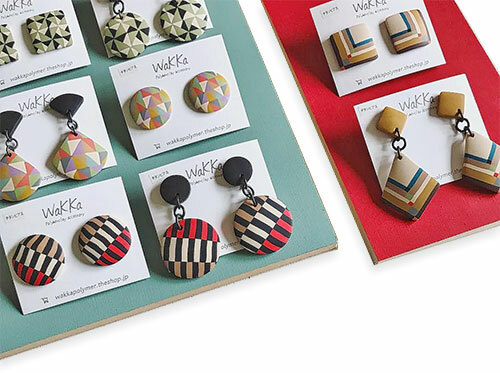 Tokyo’s Wakana Kobayashi (WakkaClay) creates crisp geometric patterns for earrings and hair accessories. Though the online translation is rough, it’s obvious that she speaks polymer fluently. In her work-in-progress shots on Instagram, the components appear to be extruded but they may be rolled carefully by hand. Something to aspire to on a Monday. Seattle’s Sarah Wilbanks mixes her media so I’m only guessing that these earrings are polymer. She often starts with translucent and adds metal leaf. Sarah says the frosty colors of this pair reminded her of winter. The outer strips hang over the underlying cones like a warm sweater. Go look at her Instagram and see if you can identify her materials. I’m usually irked when artists don’t name their media but in this case, it’s as if the material is beside the point and I’m cool with that. 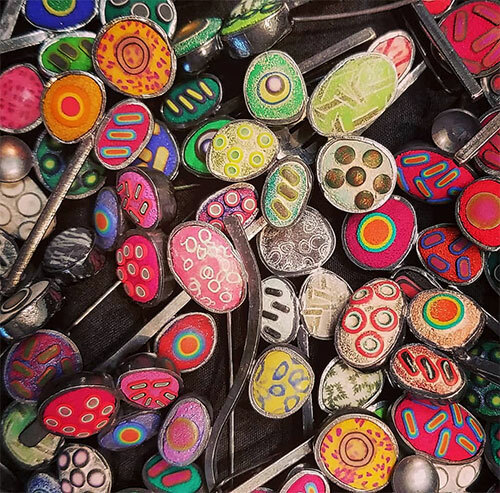 Boffo colors from Santa Fe’s David Forlano start our Monday off on the right foot with this photo on Instagram. Color is the first thing we see as our eyes skitter over the simple patterns. Everything is contained within big silver bezels that become earrings. You might expect fancy techniques but they are loose and playful and ready for the upcoming Philadelphia show November 2-4. You’ll spot Bonnie Bishoff and Lindsay Locatelli at the show as well.